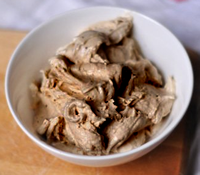 Our Banana Icecream recipe with honey is a delicious dairy and sugar-free dessert that includes honey as its sweetener. It is quick and easy, able to be prepared in just 10 minutes. Optional extras: vanilla essence, chopped nuts, frozen berries, sunflower seeds. Sit the unpeeled bananas, two at a time, in a shallow dish of hot water for a minute. Remove the skins and cut into rings. Place all the chopped bananas into a food processor. Blend all the remaining ingredients together in a small bowl and pour over the bananas. Process all ingredients for a few minutes until well blended. Pour mixture into a small serving bowl and put in the freezer. This dessert can be used within an hour, but can be stored for longer if preferred.